Want to discover a new species? Become a botanist. When plants began colonizing land over 450 million years ago they met rock. Lots of rock. And only rock. At least, that’s the image many people imagine. Geologists and paleobotanists strongly suspect that soils have been alive with microbial activity for at least 3 billion years, two thirds of the planet’s history. Fungi arrived later on the scene, followed by plants. But scientists are still not certain how and when they began interacting with each other. A team from the London Museum of Natural History found that the first land plant ecosystems were dominated by simple plants and fungi, like liverworts and lichens, in symbiotic relationships that were crucial to conquering the world above the sea, albeit slowly. In early March, Kenrick presented his team’s findings on these pioneer ecosystems at a meeting of the Royal Society in London. The problem facing paleobotanists is that fossils become smaller, rarer and harder to interpret the further back scientists look. Fossilized spores indicate that plants appeared roughly 470 million years ago. But the first fossils of plants themselves don’t appear until 50 million years later. Scientists are not certain what plants were doing during this large chunk of time. For comparison, the ancestors of whales were still walking on land 50 million years ago. Fungi are poorly preserved in the fossil record. Their soft bodies are made of a network of fine fibers that simply degrade too quickly to leave a good impression. 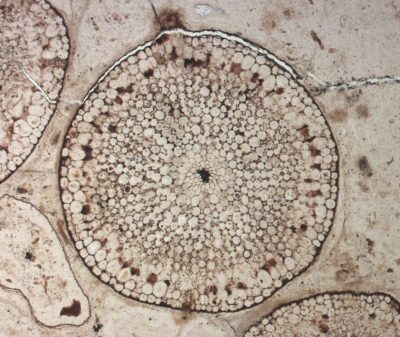 The earliest fossil evidence of land plants associating with fungi doesn’t appear until 410 million years ago in samples of the Rynie chert, a sedimentary deposit from Scotland, said Joe Quirk of England’s University of Sheffield in an email. Quirk, who was not associated with the study, focuses on the relationship between fungi, early land plants and the soils they grew in. The deposit was the focal point of the Royal Society meeting, as it contains the earliest preserved ecosystem currently known. Rhynie lies in the far north of Scotland. A small village with gentle green hills and farmland, not large enough even for a town website. However in the early Devonian period, this region witnessed a remarkable series of events. Volcanic thermal springs periodically flooded the area with mineral-rich water. The minerals quickly crystallized in the cooling water, instantly preserving the ancient ecosystem in exquisite detail, in some cases down to the cellular level. The Rhynie chert contains the earliest known land ecosystem where the associations between lifeforms are well preserved. Bacteria, algae, fungi, primitive plants and even early land animals can all be found in the deposit. The floods happened repeatedly, so they generally preserved pioneer communities that colonized the new rock left over from the previous flood. This provides scientists with a cross-section of early pioneer communities similar to those that may have first colonized land. 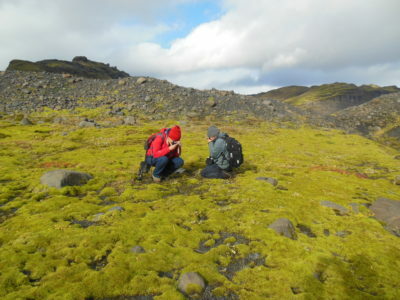 With these petrified ecosystems in mind, the team from London’s Museum of Natural History trekked to Iceland in search of the modern analogues of these communities growing on the island’s volcanic rocks. Iceland is new land. The island’s volcanos, glaciers and tectonic activity constantly expose new rock, a pristine landscape ripe for colonization by primitive plants and lichen. “There’s nothing else like it,” says Kenrick. The British team collected specimens from a variety of soils and surfaces in three separate areas of the island. Back in London, they found that communities dominated by liverworts and lichens were more similar to the ecosystems preserved in the chert than those with more advanced plants, like mosses. The results fit nicely with current theory that plants and fungi quickly formed partnerships. Primitive plants, like liverworts, lack well-defined leaves, veins, and even roots, but they often form associations with fungi. Mosses, in contrast, are one of the few groups of plants that aren’t known to associate with fungi. About 80 percent of modern plant species have this intimate relationship with fungi. Scientist call these relationships mycorrhizae. The fungi act like a root extension system for the plant. They scavenge nutrients like phosphorus, nitrates and metals from the ground and share these with the plants, which, in turn, provide the fungi with food. “One of the important things that the plants did when they came out onto land is they kind of joined forces with fungi,” says Kenrick. Quirk agrees. Paleobotanists think plants formed these relationships with fungi early on. Molecular, genomic and physiological evidence all suggest that early land plants were mycorrhizal to some degree, Quirk said. In order to cooperate, plants and fungi must first recognize each other. Scientists working on green algae — land plants’ closest cousins — found evidence of this ability in the algae’s genome. It’s likely that parts of the mechanism that plants and fungi need to recognize each other developed before plants came out onto land, says Kenrick. The particular green algae of interest is a group known as charophytes. All charophytes live in fresh water, implying that plants came not from the sea, but rather from the margins of rivers and lakes. Some researchers even propose that proto-plants may have evolved in the soil and then diverged into terrestrial plants and aquatic charophytes. Kenrick thinks it was probably a bit of both. Lichens, on the other hand, are not plants at all. They are fungi that have developed a symbiotic relationship with certain algae. Similar to plants and their mycorrhizae, the algal partner in the lichen provides food, while the fungus provides certain raw nutrients. The strategy is so successful it arose multiple times in nature. 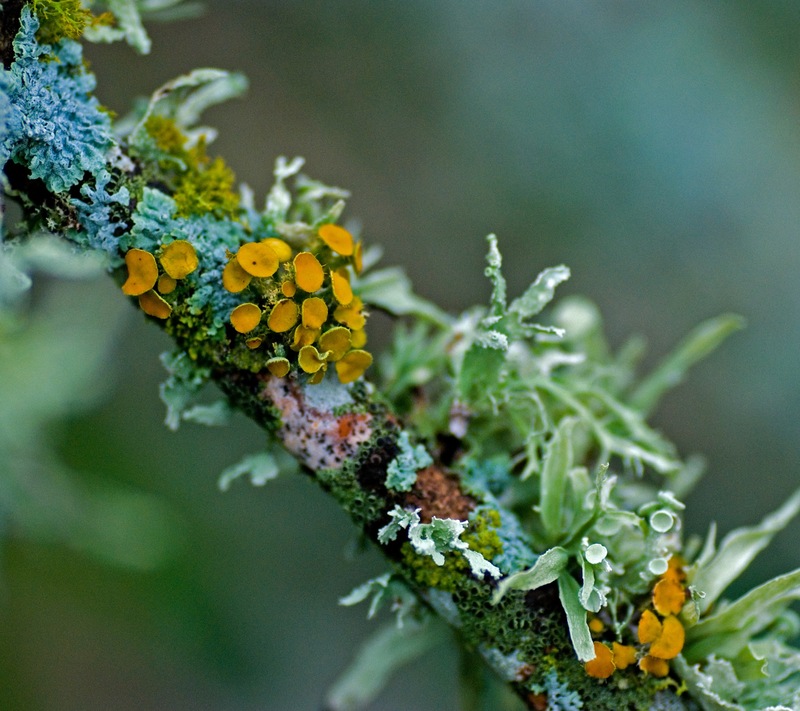 Lichens are self-contained, self-sufficient systems, says James Lendemer, a lichenologist at the New York Botanical Garden. They produce compounds that shield them from ultraviolet light and have an outer skin which further protects them from the elements. Lichens can even produce chemicals that keep pathogens at bay. These characteristics make them well suited to colonizing new habitats like early land. Lichens also seem to have a long history, predating their appearance in the Rhynie chert. Fossils in ancient marine sediments from southern China suggest that fungi were already living with algae as early as 600 million years ago. But simply finding a fungus living with algae doesn’t mean that they had a symbiotic relationship, Kenrick cautions. It’s only when you start to see structures associated with symbiosis that you can be confident of that. The puzzle confronting geologists and paleobotanists is to devise a way to test these hypotheses in rock older than the Rhynie chert. This rock would have few, if any, fossils. Fortunately, fossils are only one way to learn about the past. Here’s where the work in Iceland comes in. By matching the ancient ecosystem to a similar, modern one, scientists can learn about the early plants and fungi by studying the living ones directly. Researchers are particularly interested in learning how lichens and primitive plants alter the rock on which they grow. “[The] fungus is … mining the rock, in a way,” says Kenrick, and that leaves behind recognizable physical and chemical changes. Lichens, early plants and their symbiotic partners physically broke up the rock surface and slowly dissolved it away with a variety of acids and other chemicals. The end result is soil. The same processes are still at work all over the world, including the lava fields of Iceland. By studying the flora they found on the expedition, the team can learn to identify different species by the traces they leave behind on the rock. This gives scientists a guide to recognize life and activity in ancient soils even in the absence of fossils. “Rather than looking for the organisms,” says Kenrick, “we’re looking for their fingerprints in the rocks.” The team plans to use this approach on rock that predates even the arrival of plants on land. In March, Kenrick brought the team’s samples to the Swiss Light Source, a particle accelerator in Zurich, Switzerland. Scientists focused the x-rays bleeding off the accelerator to produce high resolution images of their specimens. Many of the processes Kenrick is interested in happen on a microscopic scale, and the Light Source’s x-ray tomography — which most people know as a CAT scan — will provide much better images than the museum’s machines can. Paleosoils are rare. Most ancient sediment comes from aquatic environments like rivers and seas. Kenrick dreams of developing the technique to a point where geologists can identify what was growing on land by analyzing the material that washed out into rivers and oceans. This would open a wealth of the geologic record to investigation. “We’re not anywhere near that,” he says. I like very much the story but I think that two parts are mixed here ( mycorrhizae = associations with plants and fungi, and lichens) making what we know about the first vegetation to develop on land a little confusing. We don’t know very much about early development of lichens on land but we know more on early plant-fungal symbiotic associations.